A pad at America's West Coast spaceport, Vandenberg Air Force Base in California, will soon receive a major makeover to transform the complex into a launch site for Lockheed Martin's next-generation Atlas 5 rocket. Following Tuesday's early morning liftoff of an Atlas 2AS booster, crews were immediately beginning preparations to renovate Space Launch Complex 3-East to support Atlas 5 missions in 2005. "This last Atlas 2AS launch begins an era of growth and change for Team Vandenberg," said Col. Frank Gallegos, 30th Space Wing commander at the base. "As Lockheed begins refurbishment on SLC 3 in preparation to launch Atlas 5, we are preparing to support the new generation of evolved expendable launch vehicles." The $200 million project will retrofit the existing mobile service and umbilical towers at the pad while adding a fixed launch platform and enlarging the flame trench. The work will be in full swing by January. "The three major phases we'll be going through next year are demolition and removal, the actual construction and then activation of the new systems. Essentially, we expect all of that work to be completed next year and then we'll transition into a pathfinder phase with the actual vehicle," Jim Sponnick, Lockheed Martin's Atlas program vice president, said in a recent interview. The first step will be digging out the existing rocket exhaust duct and removal of hardware, including the various moveable access platforms inside the mobile service tower, which shields the rocket while on the pad. "We have to take all of those (platforms) down and modify them to accommodate the larger diameter Atlas 5 booster," Sponnick said. During the construction work, the mobile service tower will be raised about 30 feet from its already 20-story height to enclose the giant Atlas 5 rockets. "We'll be doing that by adding some structural reinforcement to the existing tower and adding structure at the top of the existing MST," Sponnick explained. "Actually when we started, we weren't certain if existing tower structure would support the added height and weight and loads at the top. Our initial concept was actually to insert a new section at the base of the tower so we would have been doing the construction back in the park position away from the pad itself. "In fact as we got into the detailed design, we determined there was a pretty substantial structural margin in existence. With that, we concluded we can go with the more straightforward approach where we will be fabricating a new top section, essentially a 30-foot long insert at the top. We have to do some minimal reinforcement of the existing structure but we can do all that in place. "It's more straightforward to do it at the top because we needed to remove that top section anyway. We need to extend it and install the new bridge crane, so now we only have to attach new structure at the upper end of the MST." The existing 20-ton crane inside the mobile tower that is used to hoist rocket stages and the payload during on-pad assembly will be replaced by a 60-ton crane. 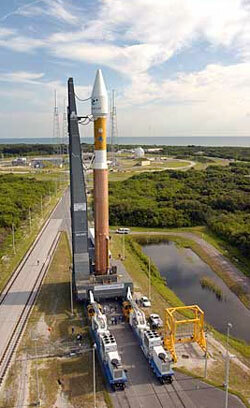 "That's in order to accommodate the higher weight of the Atlas 5 vehicle structures," Sponnick said. At the Atlas 5 rocket's Cape Canaveral launch site, the booster is put together in a vertical building atop a mobile platform and then wheeled to the pad just hours before liftoff. At Vandenberg, the SLC 3-E pad will employ the conventional concept whereby the rocket is assembled on the pad itself. In order to keep the two pads similar, a stationary platform will be built at SLC 3-E upon which the rocket will sit. "Other than being fixed, it will be very, very similar to our mobile platform (at the Cape) and it will contain all of the same interfaces to the launch vehicle," Sponnick said. "There will be no differences for the launch vehicle itself. We will build the same vehicles to fly on either coast." The Cape's mobile launch platform features a towering mast that routes fuel lines, conditioned air and other umbilicals into the rocket. At Vandenberg, the current umbilical tower will be modified to do the same job. Workers will increase the tower's height and add an adapter plate. "The architecture we put in place at the Cape was really pretty readily adaptable to this pad. The only real difference as far as the vehicle interfaces are those that we already discussed: where we have to do some adapting of the umbilical tower that exists today and building a fixed version of that mobile launch platform and that's really relatively straightforward," Sponnick said. "Operationally, the difference is we have a stack-on-pad-concept here as opposed to the assembly process we have on the Cape were we assemble the rocket in the (Vertical Integration Facility) and then roll out to the pad." Other activities at the launch complex include expansion of the pad's propellant capacity by adding another 44,000-gallon liquid oxygen storage tank to feed the Atlas 5 and overhauling the flame duct to withstand the Russian-made RD-180 main engine and the strap-on solid-propellant boosters. "We do need to dig out much of what is already there and bring new concrete in. 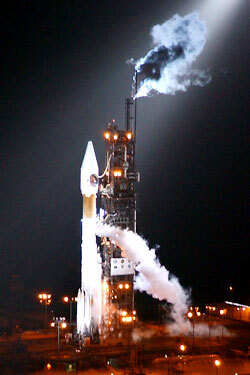 The Atlas 5, the RD-180 engine system and up to five solids does require a larger throat diameter on the flame bucket." In addition to building the Atlas 5 facilities at Cape Canaveral's Complex 41, Lockheed Martin has gained experience modifying other pads in recent years. The SLC 3-E was renovated in the mid-1990s for the Atlas 2AS rocket and the Cape's pad 36B received a facelift prior to the 2000 maiden flight of Atlas 3. "It's certainly a huge benefit to us that we're able to draw from those recent experiences that we've gone through in the last few years and apply them to this project." The construction firm Hensel Phelps has been chosen as the project manager for the SLC 3-E work. 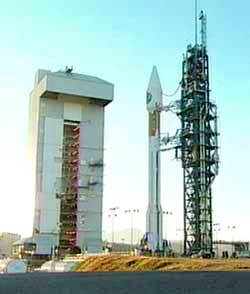 The company also played a vital role in the Atlas 5 facility at Cape Canaveral. The Air Force has slated five West Coast launches using the Atlas 5 -- four carrying classified National Reconnaissance Office payloads and one with a military weather satellite. The first mission, a 400-series rocket, is scheduled for flight in 2005. "Our first awarded launch is in the latter part of 2005, so we have a schedule that supports that," Sponnick said. In the late 1990s, Lockheed Martin ditched plans to build an Atlas 5 launch site at Vandenberg due to the fairly low number of flights from the West Coast. That gave the rival Boeing Delta 4 rocket all of the Air Force's business under the Evolved Expendable Launch Vehicle program. But earlier this year, the Air Force penalized Boeing for wrongful possession of proprietary Lockheed Martin documents concerning the Atlas 5 rocket. The punishment transferred two Vandenberg launches originally slated on Delta 4 to the Atlas 5 and three new missions were awarded to Lockheed Martin. Boeing has rebuilt Vandenberg's Space Launch Complex 6 -- the abandoned space shuttle pad -- for the West Coast home of Delta 4. The Air Force currently has three Delta 4 launches scheduled from SLC 6, including two for the NRO and one carrying a military weather satellite.